Discover the architectural treasures of Corsica, golden beaches of the Balearic Islands and exotic cities of Morocco, plus enjoy calls at Motril and Cadiz on this unique voyage. 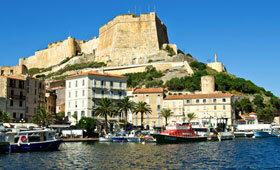 Admire the majestic 9th-century citadel or explore the enchanting Old Town during your time in quaint Bonifacio, before setting sail for the picture-postcard Balearic Islands. Mahon on the island of Menorca has a beautiful old quarter lined with Georgian buildings, while Ibiza offers unspoiled beaches. Visit Motril, nestled in the foothills of the Sierra Lujar mountains and gateway to the iconic sights of Granada, before spending three days in Morocco. Explore the thriving city of Safi which produces colourful pottery, see the impressive Hassan II mosque in lively Casablanca, and shop for souvenirs in Tangier's bustling souks. Royal Clipper then heads to ancient Cadiz, home to a magnificent gold-domed cathedral and picturesque medieval quarter. Embark Royal Clipper in Civitavecchia. The charming resort of Motril in Andalucia enjoys sunny beaches and nestles in the foothills of the Sierra Lujar mountains. It is the gateway to Granada and the magnificent Alhambra Palace. Safi is a thriving city and important port, which offers a glimpse into everyday life in Morocco. Head to the pottery works to see the colourful Safi pottery or perhaps explore the new town with its long boulevards and magnificent villas. In contrast, the walled medina has atmospheric alleys to explore. The city is home to the impressive Dar Al Bahar fortress which offers panoramic views across the ocean. Casablanca is a lively city which offers stunning Mauresque architecture. Admire the impressive Hassan II Mosque with its stunning minaret or the Casablanca Cathedral which soars above the city. Casablanca also has several fascinating museums plus lively souks, perfect for souvenir shopping. The city of Tangier is the gateway to Africa and the historic medina has pretty alleyways and lively souks. The Kasbah houses a museum with fascinating artefacts, including 16th-century jewellery and a superb floor mosaic. The ancient city of Cadiz is home to a gold-domed cathedral, beautiful medieval quarter and romantic winding streets. Perhaps join an optional excursion to the magical city of Seville with its cathedral, Alcazar Palace and Andalusian gardens. Disembark Royal Clipper in Lisbon.